Store, transport, and protect your DSLR camera, up to four lenses, and related accessories in the black Lightweight Compact Case from Porta Brace. 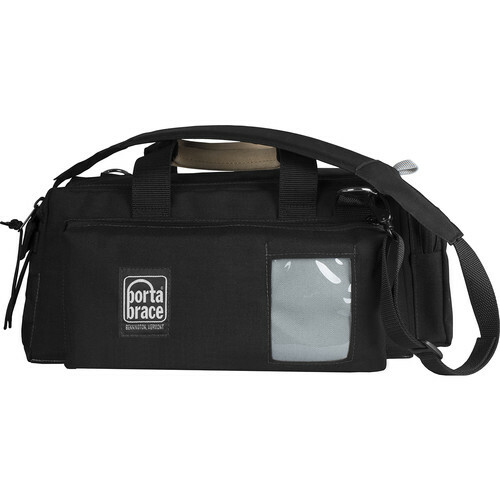 This sturdy case features a zippered main compartment with padded touch-fastening dividers, and a camera tie-down for organizing gear, three inner pockets under the lid for small items, and a clear ID window. Two exterior zip pockets provide space for accessories. Carry the case with the dual padded, suede-covered top handles, the padded side handle, or wear it with the included shoulder strap. For strength and durability, the case is constructed from abrasion-resistant Cordura nylon with a water-resistant, anti-skid bottom.